Bright field image of Macrostomum lignano. Ladurner P, Schärer L, Salvenmoser W and Rieger RM. A new model organism among the lower Bilateria and the use of digital microscopy in taxonomy of meiobenthic Platyhelminthes: Macrostomum lignano, n. sp. (Rhabditophora, Macrostomorpha). Journal of Zoological Systematics and Evolutionary Research 2005. 43, 114-126. 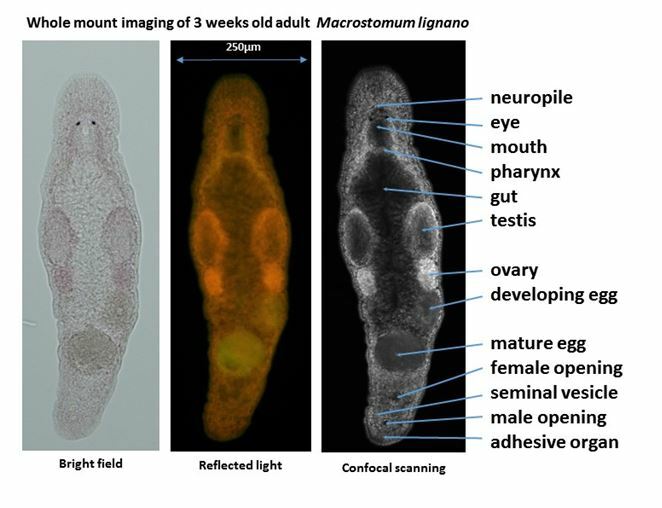 Mouton S, Willems M, Braeckman BP, Egger B, Ladurner P, Schärer L, Borgonie G. The free-living flatworm Macrostomum lignano: a new model organism for ageing research. Exp Gerontol. 2009 Apr;44(4):243-9. Simanov D, Mellaart-Straver I, Sormacheva I, Berezikov E. The Flatworm Macrostomum lignano Is a Powerful Model Organism for Ion Channel and Stem Cell Research. Stem Cells Int. 2012;2012:167265. Egger B, Ladurner P, Nimeth K, Gschwentner R, Rieger R. The regeneration capacity of the flatworm Macrostomum lignano—on repeated regeneration, rejuvenation, and the minimal size needed for regeneration. Dev Genes Evol. 2006. Oct;216(10):565-77. Pfister D, De Mulder K, Philipp I, Kuales G, Hrouda M, Eichberger P, Borgonie G, Hartenstein V, Ladurner P. The exceptional stem cell system of Macrostomum lignano: screening for gene expression and studying cell proliferation by hydroxyurea treatment and irradiation. Front Zool. 2007 Mar 9;4:9. De Mulder K, Kuales G, Pfister D, Egger B, Seppi T, Eichberger P, Borgonie G, Ladurner P. Potential of Macrostomum lignano to recover from gamma-ray irradiation. Cell Tissue Res. 2010 Mar;339(3):527-42. Nimeth KT, Mahlknecht M, Mezzanato A, Peter R, Rieger R, Ladurner P. Stem cell dynamics during growth, feeding, and starvation in the basal flatworm Macrostomum sp. (Platyhelminthes). Dev Dyn. 2004 May;230(1):91-9. Pfister D, De Mulder K, Hartenstein V, Kuales G, Borgonie G, Marx F, Morris J, Ladurner P. Flatworm stem cells and the germ line: developmental and evolutionary implications of macvasa expression in Macrostomum lignano. Dev Biol. 2008 Jul1;319(1):146-59.